Mandlenkosi has an inability to tell a lie, and so he is often called Honest. He was raised in Mdantsane, the second largest Black Township in South Africa. He is part of the royal Xhosa family called Tshawe. After finishing high school he escaped the turbulent life in the ghetto and went off to Bible College where he earned a 4 year diploma in Theology. A turning point occurred in Honest’s life in 1985. Not only did he marry Noxolo (Veronica) but he also met Kelly. Honest had a vision to teach the Word of God. Kelly encouraged him to start an evening Bible college in the industrial center of the Transkei, so that the factory workers could study the Word after work, accordingly Grace Evening Bible College was formed. When the factories began to shut down however, so did the evening Bible college. After praying with Kelly, Honest began to accept the fact that he had an apostolic calling. 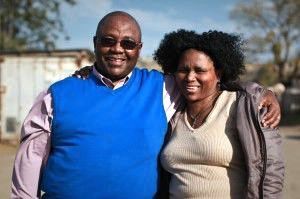 As a result of planting many churches in westernized areas of the Transkei, Kelly and Honest started African New Life Ministries (ANLM), which gives oversight to many developing Xhosa churches. Then in 1999, Honest and Kelly started Gatyana Bible College, where he remains as the president. Noxolo is often referred to as Veronica by the English speaking. She also was raised in the ghettos of Mdantsane. She met Honest at church and they have been married since 1985. They have 5 children and currently reside in Msobomvu, Transkei. Noxolo has cared for children all her life and has a special concern for the children of the Transkei. As a result of a lot of prayer Noxolo and Kelly developed and operate the Grace Children’s Shelter (GCS). In addition to providing oversight to the GCS, she also works full time at a furniture company. Both Honest and Noxolo have been working with Kelly and the mission since 1985. They remain as a valuable part of the mission’s leadership team.